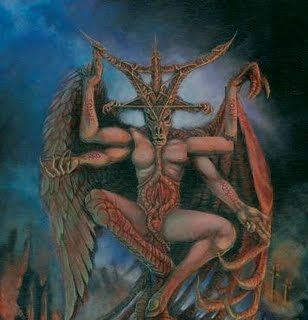 This is a type of devil which belongs to the satanic group. It has four hands as the name suggests and helps out the magician in a lot of ways. The magician has a very strong pact with him and this devil makes the magician wealthy. These devils attack the victim at around 3am when the victim is fast asleep .Then they try to harm the victim by clutching him which makes the victim feel suffocated and he or she cannot budge even slightly. In some cases people started reading Ayatal kursi when they felt that the devil is trying to attack them. The power of ayatal kursi loosens the grip of the devil on the victim. Although the victims cannot move, yet they can read ayatal kursi in their hearts even in that helpless position, which is powerful enough to disarm this devil. Sometimes these devils may clutch their victims with their nails which are 2-3 feet long and black in color. Their nails can be as strong and dangerous as iron nails. 1 These devils attack at night, when all are asleep. 2 A feeling of being in someone’s tight grip and being clutched by someone at night in a barbaric way. 4 A headache in the morning when one wakes up. 5 A pain in the eyes and a burning sensation in the hands. 1 Read ayatal kursi 111 times before going to bed. However, this devil may still cast a magic spell from far. 2 The victim should start reading ayatal kusrsi when he feels that he has been pounced upon by this devil. Since his grip is very strong so he may not leave in one go. So the victim should continue reading ayatal kursi in his heart and by the time he has read it around 11 times, the devil’s grip loosens. 3 Read surah Naas 100 times after each namaz.